As he neared the end of his Grand Canyon University premed degree program, James Prigge realized his heart wasn’t in doing the required testing and interviews for medical school applications. Prigge felt called elsewhere, so the former resident adviser decided to stay put. He applied for jobs at GCU, earned a position as an enrollment counselor and began taking courses in the University’s master’s program in public health earlier this spring. 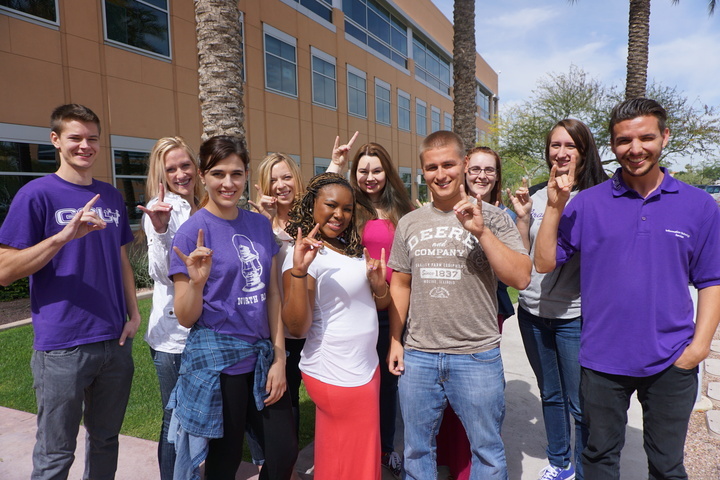 Recent GCU graduates (from left) Andrew Kretzmann, Ellie Evans, Allison Bauer, Hillary Olsker, Shauna Edwards, Kelsi Thomas, James Prigge, Jessica Ament, Brittney Spackman and Tyler Troth put their Lopes Up at the Peoria site, where their roles range from enrollment counselors to IT desktop support. Prigge, 24, who helps Colangelo College of Business online students, is an example of the type of GCU-educated, entry-level, full-time employees the University wants to produce. After hiring 67 graduates in 2014, the University so far this year has hired 28 recent grads for a range of positions in Academic Web Services, Facilities, Ground Admissions, Information Technology, Office of Academic Records, Online Operations, Residence Life, Strategic Educational Alliances and the Qualifying Center, according to the talent acquisition group in the Human Resources Department. For many new hires, their first full-time jobs are entry points into a university where the possibilities for future jobs are plentiful due to the rapid pace at which GCU is growing. “I never thought I’d sit at a cubicle, but the way this job is going now, and it’s going great — I might be here forever,” said Prigge, who works in the Peoria office complex. He enjoys speaking with students and helping them navigate their degree requirements. He’s recommended several friends for jobs at GCU, and those friends have recommended others. Prigge, who recently was promoted, said he dreams about someday opening a hospital overseas, and feels connected to his alma mater and its mission to improve the lives of students and the community. 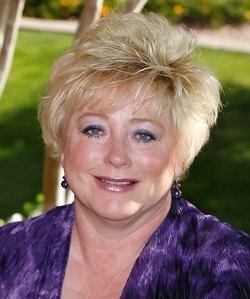 GCU Career Services Director Jacqueline Smith said her office’s partnership with the HR talent acquisition group has helped the University plug its best and brightest into meaningful jobs. Each March, the departments work together to host the GCU Wants to Hire You job fair, giving students plenty of employment options. Many of the new hires are former student workers who are familiar with University culture. They have established relationships with faculty and staff, and can comfortably perform their entry-level duties, while gaining experience to earn a position in a field that more closely aligns with their degrees or passion. Like Prigge, recent psychology graduate Lily Schwartz, 22, saw the opportunity to work for her alma mater while pursuing a master’s degree in industrial and organizational psychology. Smith hired Schwartz and alumna Sara Lynch about a year ago to work in Career Services after learning that both had earned high commendations from previous supervisors. Schwartz, who was a manager at McDonald’s before and during college, also worked at the Student Contact Center and as a tour guide at the Antelope Reception Center. She told her supervisors she wanted a position in which she could make a greater impact in the lives of her fellow Lopes. Her job is preparing her for a career in which she can continue to care for others and help them navigate their own careers, she said. “What’s important, and we talk about this in our orientations, is it’s not just a student worker position or an entry-level position,” Schwartz said. “There’s no position too little, or that’s preventing you from gaining valuable experience. You’re still networking, gaining that experience and developing skills.